On the surface, the mainstream fitness industry, by and large, promotes a superficial, sensual picture of success. We see images of chiseled abs, bikini bodies and proud smiles framing flexed muscles in gym selfies and advertisements. We are told that this brand of fitness will make us happier, more productive and improve our quality of life. But beneath the surface, a darker reality lurks. Average parents, teenagers and young adults struggle to find themselves in a fitness culture of self-objectification. Despite our hard work, we grow impatient at our stubborn layers of fat and wonder why our fitness role models seemingly don’t have any. Instead of increased productivity and energy, we find body image issues and wounded self-esteem. Many of us jump into extreme diets or fitness routines, chasing an impossible body image standard, only to eventually burn out and quit. After training thousands of Muslims of all ages and fitness levels for years, I have seen the damaging effects these superficial fitness trends have on our psychology, self-esteem, bodies, and motivation. The multi-billion-dollar mainstream diet and fitness industry has been criticized by psychologists for promoting a hyper-sexualized, unrealistic, superficial approach to health and fitness (1). These trends have been observed in mainstream fitness promotional images for decades. One study conducted in 1989 reviewed fitness promotional material and concluded that “women are generally portrayed as sexual objects… the great majority of advertisements still idealize women as passive, less powerful and less active than men… and rarely exempt from sexual innuendo” (2). Hyper-sexualized trends persist in fitness workout programs and gyms today. A recent study interviewed both personal trainers and gym attendees and concluded that a prevailing view of “your body is your business card” dominates the modern approach to fitness (3). The psychological impact of these hyper-sexualized trends on body image and self-esteem cannot be understated. Thus, the fitness industry outwardly claims to empower men and women while at the same time acting as a vehicle for widespread self-objectification (4). I believe a Barakah-based fitness model is the only way to see lasting changes that improve our health and productivity holistically. Changing our approach to fitness invites Barakah into our fitness pursuits and allow us to see greater impact and improvements in our health with the same effort. 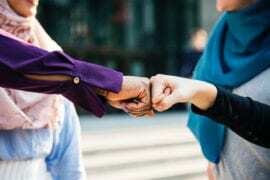 In a previous Productive Muslim article, the difference between Hustle culture vs. Barakah-focused productivity was discussed as a powerful mindset shift in terms of productivity. The Barakah effect argues that when we align our actions, mind, and soul to the way Allah wants us to live in this world, we will see increased productivity and impact in our lives. The same is true when it comes to our fitness! When we shift our approach to fitness away from the superficial focus eschewed by mainstream fitness industry, we can experience Barakah in our health that will boost your long-term fitness results, overall health, and wellness, energy, confidence, and self-esteem in the process. 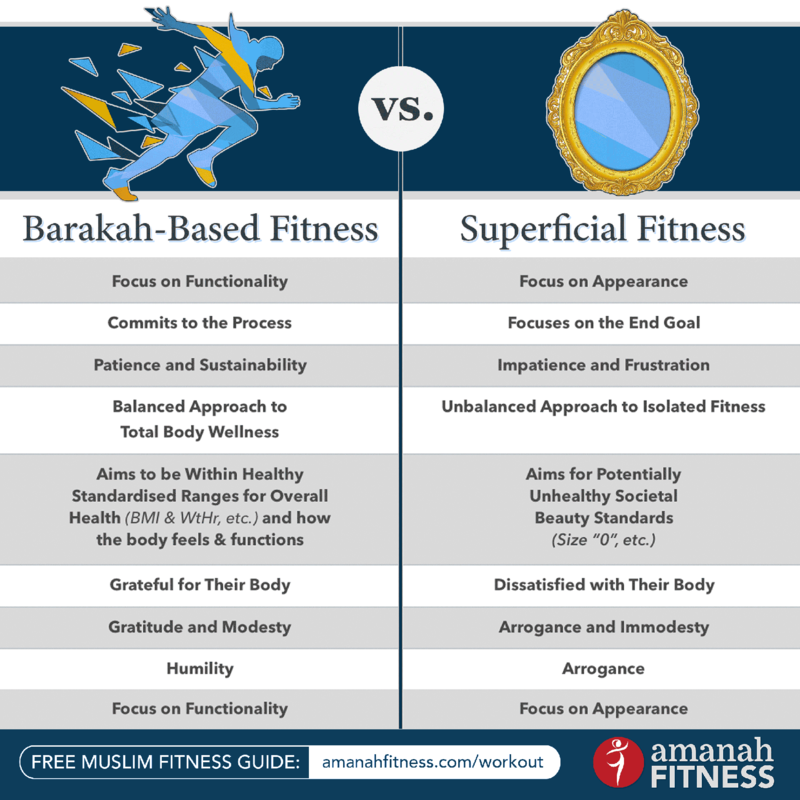 In the following infographic, I compare 8 ways in which someone following a Barakah-based fitness practice differs from someone following trends established by the hyper-sexualized, superficial fitness industry. Someone with a Barakah mindset approaches fitness by looking at their personal weaknesses and medical conditions and strives to improve overall health and functionality to increase physical and spiritual performance. They understand the role of fitness is to improve worship and social impact, instead of just for the sake of appearance alone. Versus someone with a superficial approach to fitness looks at areas of their body they “don’t like” and tries any tactic possible to change their appearance, even if it is holistically unhealthy (eg. crash diets, cleanses, etc.). Many fitness enthusiasts start off with a superficial focus and eventually burn out after years of a healthy lifestyle because superficial appearance focus becomes difficult to pursue long-term. The body naturally changes with age, injuries and lifestyle shifts. If the purpose of fitness was only for the sake of superficial appearance, eventually a person will become demotivated and drop off. 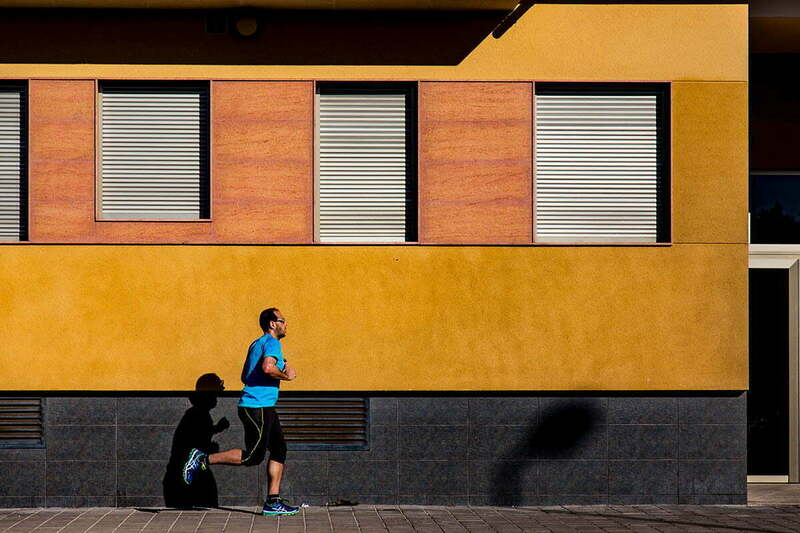 A functional approach to fitness is long-lasting and stands the test of time. Someone with a Barakah mindset commits to the process of self-improvement in physical health, not just the end result. They understand they can be rewarded by Allah for their efforts to improve their body. This process is as valuable as the end result, which becomes deeply motivating to continue pursuing an active lifestyle. Versus someone with a superficial approach to fitness strives for changed appearance and can get easily frustrated with their body when faced with slow progress. 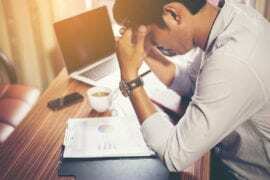 Once again, this can quickly lead to burnout and getting discouraged. Someone with a Barakah mindset approaches their desired health changes with patience while understanding each small change will lead to self-improvement. This is likely to lead to lasting, sustainable health habits. Versus someone with a superficial approach to fitness approaches desired body changes with impatience and wants to quickly attain their coveted body image as quickly as possible. This is likely to lead to short-term, unsustainable fitness or diet phases. Someone with a Barakah mindset aims to improve their physical, mental, spiritual, social health holistically and will not undertake extreme measures in one domain by sacrificing another. Exercise practices are balanced and include routines designed to push yourself and develop your body, as well as restoration to allow the body time to recover. Versus someone with a superficial approach to fitness may engage in short-term radical approaches to improve appearance that can jeopardize total-body health. For example, a fitness model who severely starves and dehydrates before a modeling competition is sacrificing long-term health for short-term appearance goals. Exercise practices may be imbalanced and overly tax the body because restorative work may be seen as a waste of time. Someone with a Barakah mindset is grateful for their body and the way Allah has shaped each of us individually, even if they do not match societal standards of beauty. They understand pressures to conform to societal standards exist and can create mental and emotional pressure. Despite these pressures, they constantly remind themselves to be grateful for their body until it becomes a practiced habit. Versus someone with a superficial approach to fitness feels their body dictates their self-worth. They may experience self-loathing if parts of their body do not match societal beauty standards. This is an easy mindset to fall victim to in an overwhelming culture of fat-shaming. However, we can all work on shifting towards gratitude through positive self-affirmations, dhikr, and practicing other aspects of the Barakah-based fitness mindset. Someone with a Barakah mindset strives to show gratitude to Allah for the gift of improved health by practicing modesty in fitness. as believers show gratitude by using Allah’s gifts in ways that please Him. Versus someone with a superficial approach to fitness inadvertently falls into arrogance and immodesty. They view any muscle gains as an opportunity to show off. This commonly results in wearing tighter, exposed clothing and increased boastfulness and self-objectification in the gym and on social media. The fitness industry promotes a culture of self-objectification. However, as Muslims, we must be careful not to fall into these trends, as it is a perversion of the true objective of fitness: to better the body in servitude to Allah . Dressing modestly at the gym is not just “something Muslim women do”; it is an expression of gratitude to Allah for our bodies and should be taken seriously. Someone with a Barakah mindset feels humbled by health improvements and understand any changes to be a gift from Allah as a reward for their striving to be better. They may dua to Allah for improved health in their journey and are thankful at their progress. This results in a positive attitude and mindset along all stateless of the fitness journey, despite potential setbacks. Versus someone with a superficial approach to fitness feels entitled and arrogant from health improvements and views any gains as being the result of their own effort and skill. Engaging in constant dua for good health (as is seen in the morning and evening adkhaar) is a strategy to shift towards a barakah based fitness mindset. As Muslims, it’s important to remind ourselves that the importance of a healthy body has always been emphasized in the Islamic tradition. This emphasis on our physical health is so fundamental to our Islamic rituals that we are instructed to ask Allah for health in our body multiple times every morning and evening as part of the Prophetic Morning and Evening Adhkaar Supplications. When our bodies are healthy, our productive and spiritual potential increases. When we ask Allah for improved health, we understand that good health is a blessing from God that we are in need of. This creates a culture of gratitude and modesty as opposed to arrogance and immodesty. When we ask Allah for health, we are motivated to “tie our camel” by taking steps to enhance our functionality to reach improved levels of health every day. Notice that these supplications for health ask for and imply body FUNCTIONALITY and do not necessitate a sculpted, model-like physique or particular body image. Functional fitness is defined as exercises that utilize the entire body with the intent of developing foundational strength to make every task in life easier. To get started with functional training, you can download my modest Muslim Energy-Boosting workout guide – you will notice all the movements are bodyweight, balanced movements meant to strengthen your entire body for improved energy. By focusing on functionality, gratitude, modesty and a balanced approach to total-body wellness, we can invite Barakah into our physical health by practicing faith-based fitness for maximum impact. A Barakah approach to fitness is based on the understanding that our bodies are an “Amanah” (trust) from Allah that we are meant to use to unlock our full potential in this life. Approaching fitness with this mindset creates a culture of God-consciousness instead of self-consciousness. Someone who understands the role of our bodies in achieving our ultimate purpose in life will have a dramatically different FUNCTIONAL approach to their health, versus someone who approaches their health for superficial reasons. Have you been affected by the superficial focus promoted by the mainstream fitness industry, either consciously or unconsciously? Leave a comment below! (1) Hasyim, M., & Arafah, B. (2017). Sexuality For Sale At Television Advertising. Turkish Online Journal Of Design Art And Communication, 7, 89-101. (2) Duquin, M. E. (1989). Fashion and fitness: images in women’s magazine advertisements. Arena Review, 13(2), 97-109. (3) Hutson, D. J. (2013). “Your body is your business card”: Bodily capital and health authority in the fitness industry. Social Science & Medicine, 90, 63-71. (4) Stern, M. (2008). The Fitness Movement and the Fitness Center Industry, 1960-2000. Business & Economic History On-Line, 6. Stay tuned to the launch of The Barakah Academy: An online education platform for faith-based personal and professional development that will teach practical skills in line with Barakah Culture. If you’re interested to learn more, simply add your name to the waiting list here. Join the Barakah Academy Waiting List! Amina Khan is an award-winning fitness specialist and Founder of Amanah Fitness, dedicated to restoring health in the global Muslim community. She has been named Canada’s Top Fitness Professional of the Year for her work promoting weight loss and fitness for Muslim women around the world. Her goal is to inspire Muslims to revive the Sunnah of healthy active living! She is currently pursuing her Ph.D. in Health Psychology. You can get her free modest workout guide at www.amanahfitness.com/workout!